Since moving to Bristol, the Second Floor has come up time and time against in discussions about the best restaurants in the city. The reviews on sites such as Tripadvisor tell a similar story. So when the New Year offer of a three course meal for £19.50, with a friend dining for free, emerged, we jumped at the chance to pay them a visit. Accessible through the store during normal opening hours and via a private lift when the store is closed, the restaurant gives the impression of old-school glamour. A decent amount of space between tables means that conversation is possible without having to shout over neighbouring diners, and there is plenty of room for the black-clad staff to wait the tables. The restaurant is decked out in various shades and textures of gold, from the shiny sofa-style seats and painted ceilings, to the curtains on the floor to ceiling windows and, bizarrely, carpeted walls. The decadence of the surroundings suggests that the venue is keen to be seen as an elegant, luxury dining option. We didn’t, however, feel that the service levels on the night matched up to what we had expected from the surroundings. The restaurant wasn’t particularly busy, yet we still waited for 35 minutes before ordering, and an hour in total between arrival and our starters being served. The bread basket didn’t arrive until shortly before the starters, and while the red wine was left on the table, the white was taken to the other end of the restaurant to be chilled, rather than an ice bucket being left at our table. While waiting, however, we were served some fantastic mushroom arancini: small, fried balls of rice and mushrooms that were perfectly seasoned and whetted our appetites for the main event. 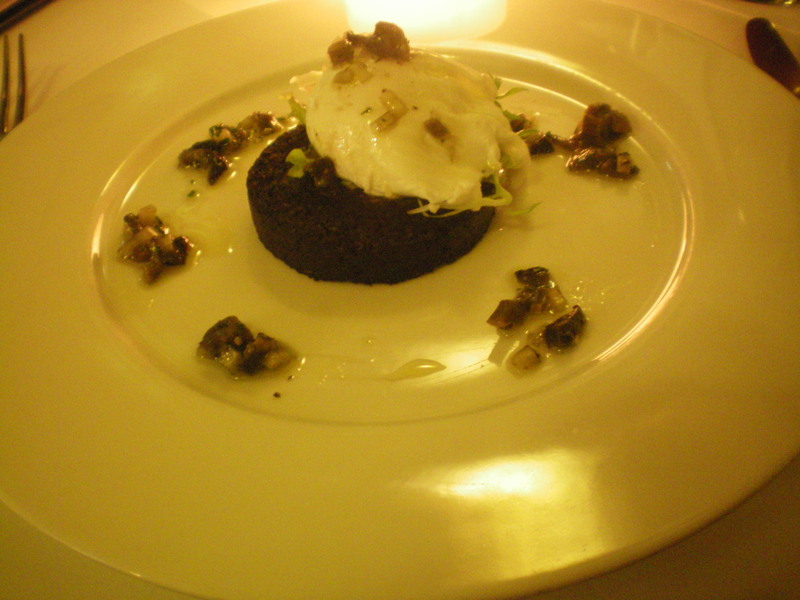 I began my meal with a Stornoway black pudding salad: a slice of black pudding topped with a soft poached egg and served with a roast field mushroom dressing. The mushroom dressing was vinegary and delicious, but there just wasn’t enough of it to hold its own in terms of flavour when paired with the black pudding. While cooked well, the dish could have done with a little more seasoning, and would have benefited from a warmed plate. Service levels perked up after this, with only a 15 minute wait until our mains were served. 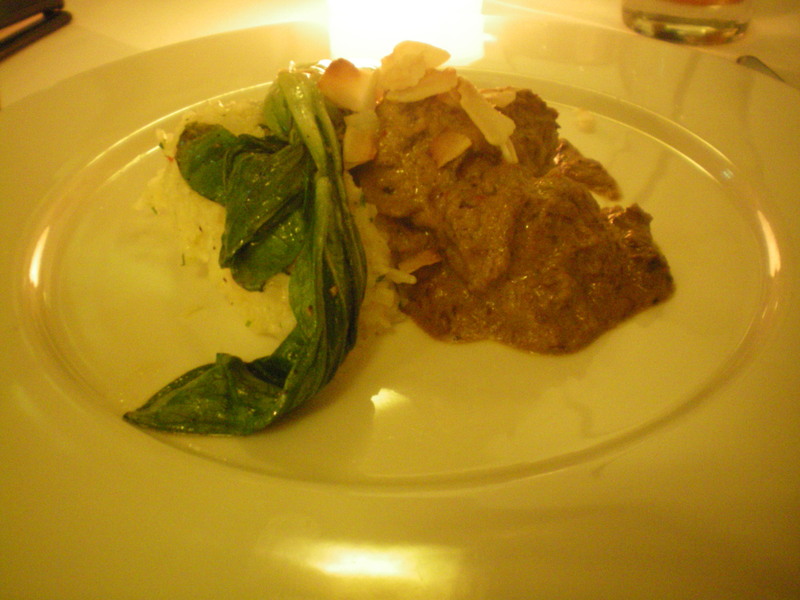 I’d opted for a ruby red beef rendang, served with bok choi and a coconut pilaf. The smell of coconut from the sticky, slightly sweet rice hit me as soon as the plate was brought to the table…the flavours were fantastic. The rendang sauce was also tasty, my only complaint is that biting into a whole star anise halfway through the meal was a bit of a shock! Fellow diners enjoyed the coq au vin, with the chicken perfectly tender and falling off the bone, but complained that the parsley mash on which it was served was far too salty. Ordering desserts was a bit of a nightmare. Rather than bringing the set menu back to the table, the standard dessert menu was provided to each of us. The three set menu desserts were listed at the bottom, with a note saying that they could also be ordered a la carte at a cost of £5 each. Some of our party were tempted by the cheeseboard rather than dessert, assuming that we would simply be able to upgrade – however, we were told that we would have to opt for the 2 course set menu option (charged at £17.50 per head) rather than 3, and pay the full £8 for the cheese course. This came as a bit of a surprise to us: firstly because we hadn’t been told that there was a two-course option available (it wasn’t listed on the set menu), and secondly because the upgrade price seemed absurd. We abandoned that plan and ordered desserts from the set menu. 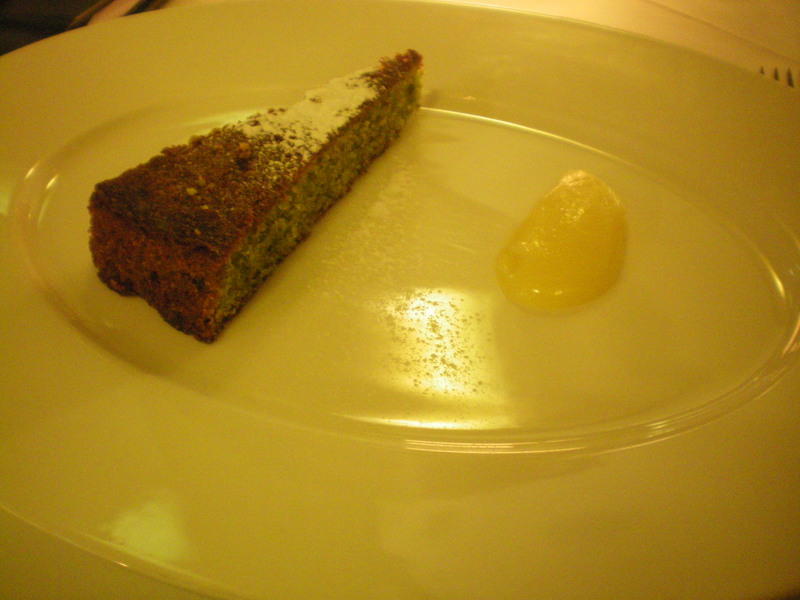 My dessert of a pistachio polenta cake was served with a beautifully sweet yet tangy lemon curd – the cake itself, however, had a gritty texture due to the size of the chunks of pistachio, which didn’t really appeal. I went to the restaurant yesterday with some trepidation following your review- however I am happy to report that service was swift and efficient and the food was of excellent quality – I had the smoked salmon followed by the pork belly, both of which were delicious. Keep up the good work with the blog, I only wish I could dine out around Bristol as much as you do! Glad to hear you enjoyed your meal – did you go full a la carte, or using the special offer? I've heard mixed reviews from people! Thanks for the kind comment re: the blog too…it's fun eating out so much, but my bank balance is starting to suffer! We, too, visited Harvey Nicks top floor restaurant on a buy one get one free. We went with a couple of friends who have large appetites. The service was fantastic and the French head waiter was extremely amusing. He continuously returned to our table to tease us or tell us some anecdote to make us laugh. He also overheard us saying that we were going to the Blanc Brasserie the following morning for breakfast and did his upmost to persuade us to go back to Harvey Nicks instead. Certainly, the portions were small and our greedier friends could have eaten it all again but we were totally satisfied. Every mouthful was delicious and it all looked wonderful. The restaurant gives diners in Bristol the chance to eat in luxurious style without the high price tag.